This recipe makes a bunch. It is great for a cookout, picnic, barbecue or a potluck. It is a dish that travels well. 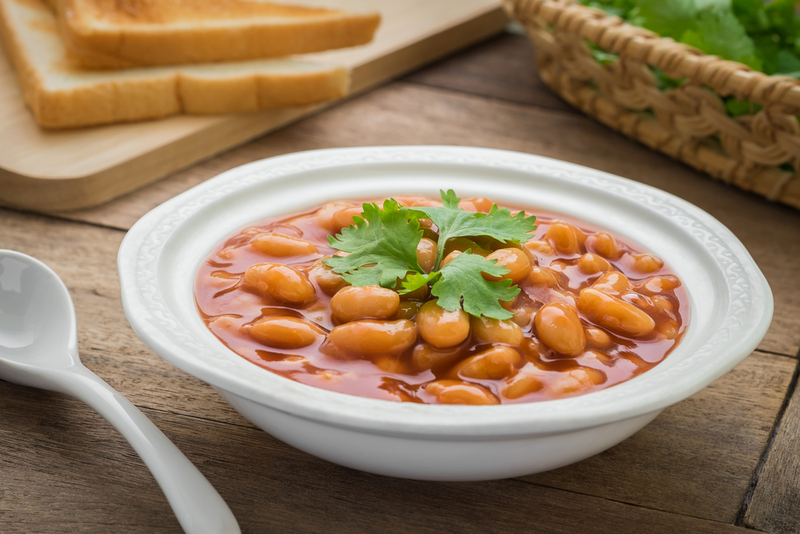 Leftover baked beans seem to even taste better. The balance of sweet and heat is great combination that will make you crave it time and time again. The bacon adds a great smoky touch. If bacon is not for you, vegan bacon can be substituted. Heat a sauté pan over medium heat. Add oil, bacon, onion, garlic until onions are translucent. Add stock, vinegar, tomato paste, pepper flakes and syrup. Reduce on med/low until a syrup texture emerges. Drain all 4 cans of beans. Add the drained beans and the can of baked beans together with the sauce. Place in greased casserole pan. Bake in preheated oven at 350F/180C for about 70 minutes. Sometimes it takes a little longer. You want the center to be hot and bubbly. You will need to let it set before serving. It will be too hot to eat right away. Plan on taking it out about 20 minutes before you want to eat it. It is also good served at room temperature.